Roster has now been posted for the new season - no mugshots yet for our freshies. As expected, Thleen no longer on the roster having gone pro. No incoming frosh divers, but Maggie Gallagher's no longer on the list of our divers. Glad you were able to find the pic UAC. I still can't figure out how to link IG stories. Reckon a quick mention's in order here re froski Cassidy sporting a knee brace/sleeve - may well explain her absence from US Nationals this summer? 2nd half of season after the winter training trip @ Hawaii predictable as usual (away duals @ ASU & UofA, followed by hosting 'SC, UCLA & Furd @ Spieker). 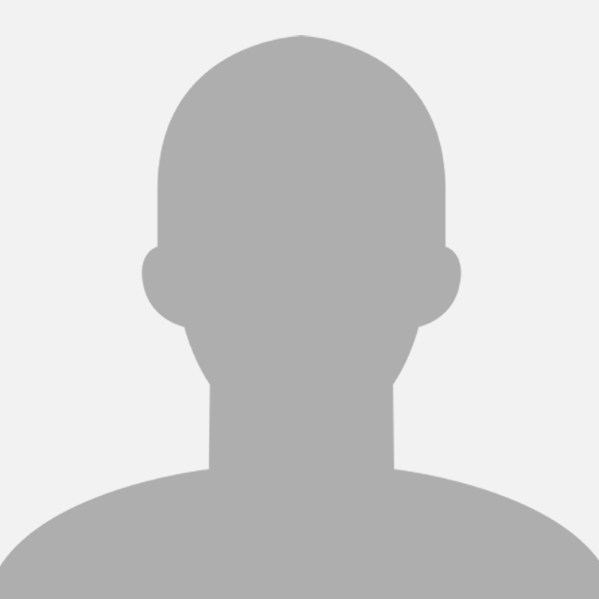 Also appears that mugshots on the roster page will soon be updated for the new season, yay! Seems like a beary luvly quality bonding time being had by the whole team this weekend...mamma mia!!! Well, in anticipation of SwimSwam's College Swimming Previews & Team rankings for the 2018-2019 season coming out in a day or two with an article on our likely #2 ranked Golden Bears, here are their 2018-2019 OUTLOOK for the competition. For a more in-depth analysis, please go & read up the full text in the links below. Will add the #1 ranked Furdettes (er, SS rankings, not necessarily mine haha) to this post once the writeup is published. Last year's Cardinal team was so historically dominant that it's impossible to be replicated. The departures of Manuel and Ledecky are obviously huge, but Howe and Hu were also key cogs in the machine that were relied upon heavily and seemingly delivered every time. That being said, the returnees and the incoming freshman class certainly look like a team capable of bringing Stanford a third straight national title. Taylor Ruck has limitless potential, and looks as though she'll be able to instantly bring in 50+ individual points and be a driving force on four relays. Ella Eastin, Katie Drabot and Brooke Fordecarry over from last year and will be relied upon a bit more this year with such important pieces now gone, but all three have proven they can shoulder a big load, bringing a lethal combination of talent and versatility. It also cannot be overstated the help brought in from the likes of Tankersley, Nordmann, Fackenthal and Goeders, as twelve of their 20 finals relay positions from last year are now gone, and those four, along with Ruck, will be able to seamlessly step in and keep the team competitive across the board. While they're now weaker in the distance freestyles and perhaps the 100 fly, they got a whole lot stronger on breaststroke, last year's weak point (if they had one), and now shape up to be the top team in the country there. Another relay sweep is optimistic, and they probably won't be putting up record setting point totals like last year, but the Cardinal are poised for their first three-peat since 1996 (when they won five straight beginning in '92) and the first three-peat of any team since Auburn did so from 2002-04. Cal lost Baker and Thomas, two huge talents, but their roster is padded with so much primo talent that they will fare just fine without them. Their freshman class is a bit more modest than some of the classes we've seen in the past (Baker-Bilquist-McLaughlin?! All in one class?!) 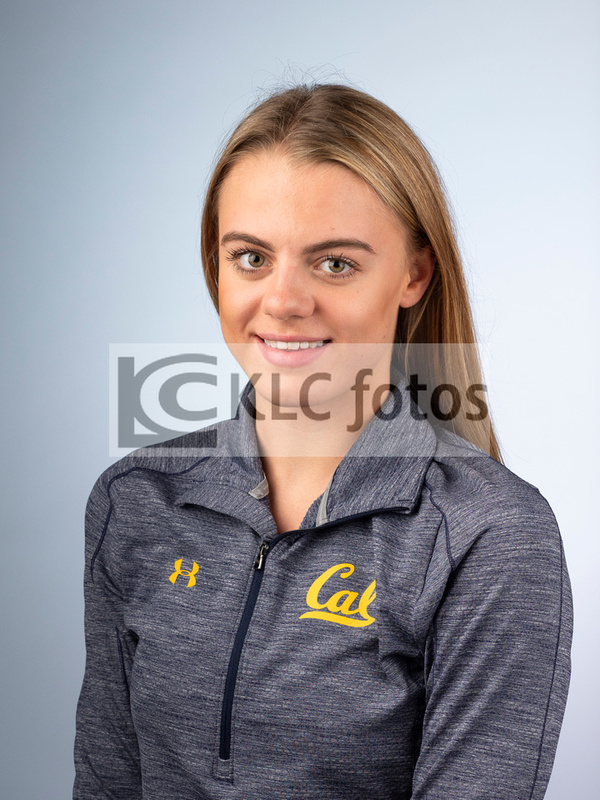 but has the potential to bite, and the depth for relays paired with the fact that at least 7-8 women are poised to score on their own means Cal should be in good standing for another 2nd place finish. Michigan appears to be a very good place heading into this season, despite the losses at the top. They're strong across the freestyle spectrum, and could even score more individual points there than they did last year. Thanks to Tucker, breaststroke is a strength rather than the weakness that even many top-notch teams have. Their fly group should get better this year, and the other three strokes are strong enough that they don't have to have a stellar backstroke group. Add in a diver or two who can score at NCAAs, and you've got the recipe for an incredibly strong team. We'll toss in the usual caveat about how Stanford and Cal are still juggernauts, but Michigan stands a very good chance of being at the top of the "not Stanford or Cal" sub-division. Before we get into our outlook, it's important to note that Texas is a team that will again benefit from its diving group - the Longhorns return two NCAA scorers, including 2018 platform runner-up Murphy Bromberg. Adams and Pfeifer are back with potential for more than one A final appearance each, with freestylers Evans and Carrozza and butterfliers Rule and Case lurking and carrying potential for individual scoring. There isn't a significant weak point in this roster, and the stud freshman sprinters are going to elevate relays and should both have great scoring chances on their own. Texas should give Louisville a run for their money, and with Michigan and Texas A&M suffering considerable graduation losses, the 'Horns may have enough in the tank to jump up - maybe just enough for a coveted top 3 finish. With no big losses but no freshmen who seem immediately poised to make an impact at NCAAs, there's every reason to think that the Cardinals should perform very similar to how they did last year. There doesn't immediately appear to be a ton of depth, in terms of NCAA scoring, behind last year returners, but many of them saw some big improvements last year. They're not going to challenge Stanford, or even Cal, but they definitely have the ability to hold position and maybe jump up a spot or two if everything breaks right. Sprint free takes a huge hit due to Gastaldello's departure, and the medleys may run into trouble finding a strong enough lead-off leg. The sheer depth on this roster shows, though, as A&M will still have a fantastic IM and breaststroke group led by Pickrem and Belousova. Rasmus and Portz will be key in keeping the free relays together, Quah and Pike could do substantial damage in butterfly, and key sophomores like Yelle and Toney will be relied on to pitch in individually. Freshmen Kopenski and Carlton might end up yielding considerable contributions, while Carlton will be a very important piece in the medley and sprint free relay re-works. A&M will be hard-pressed to repeat in the top 3 with their relays under renovation, but there are still several high-impact individuals on this roster who have a proven record of getting the job done - this team is down, but they're not out. All in all, the Hoosiers are realistically looking to compete for another top-10 finish at NCAA's. Based on what they lost and what they have gained, there isn't any tangible evidence that suggests they can make a large jump as a team - say top-5 or top-3 NCAA finish. As they have been for the last 3 years, Indiana will be led by the superstar King. They gained some much needed talent to fill holes in the sprint freestyle arena, but that likely won't materialize into significant NCAA points right away. IU's top 3 medley relays took a big shot with the loss of Rockett and will need an unlikely hero to step up in a big way if those relays want to stay in the top 8. While we don't dedicate a section entirely to diving, it's worth noting that Tennessee had one-even scorer Rachel Rubadue put up 7 points as a junior and brings in Georgia state champ Rachel Renner. There was a lot of internal discussion within our staff regarding Tennessee's #8 ranking and for good reason. It's hard not to get excited by the ceiling of this team. Scoring last year's NCAA meet just based on season-bests (using our Swimulator program), Tennessee finishes 6th at NCAAs, and just a half-point back of Louisville in 5th. Without two very strange relay flubs alone, Tennessee scores about 56 more points than it actually did last year. They also graduated very few point and impact scorers from last year. On the other hand, there are plenty of teams that look great on paper, but it's hard to project a team to swim to their ceiling when they previously haven't done so at NCAAs. Outside of projecting the future (which is usually a difficult task), the biggest pluses for Tennessee are an absolutely loaded sprint group (complete with dominant relays), great IMers and flyers and all the momentum in the world. On the flip side, the issues are the very painful graduations of the team's best backstroker and breaststroker along with a freshman class that looks like great developmental talent without any surefire instant-impact additions. All that combined makes this #8 ranking one of the higher-variance rankings of our top 10. Check back later this fall, because this is one high-talent team that could see some serious fluctuations in our running Power Rankings. This is a thinner roster than we're used to seeing with the Gophers, but there's no doubt they have a proven star in Kozelsky and enough talent to field strong relays. Look for their medleys to make noise again this year, especially the 200 medley, which is looking for an encore after cracking into the A final in 2018. Padington, Nack, and Avestruz hold things down in the freestyle, but it would be hugely beneficial if a newcomer can step up and become a relay asset for Minnesota. It certainly helps, though, that they return 2018 NCAA 1-meter diving champ Sarah Bacon as well as NCAA scorers Kristen Hayden and Morgan Justus. Louise Hansson, Madison Wright, and breaststrokers Scott and Aroesty are the big returners for the Trojans. This team is very strong in butterfly and breast, but isn't incredibly deep in backstroke. Caldwell helps the backstroke hole and makes the sprint free group considerably stronger. Kirsten Vose (a 47/1:42 free split on relays, and a 59/2:07 breaststroker) and Leach are both on the roster for the upcoming season, and the Trojans will be hugely supported if both are back and near their bests. Sullivan is the blue-chip addition of the freshman class who should be a great individual scoring option, but the Trojans may need to employ some interesting relay choices and bank on their stars delivering to stay afloat in the top ten nationally this season. It's getting tougher and tougher for recruits to come in with times that'll score big points at NCAAs, but this freshmen class feels like it has a very high ceiling. How much they develop their first year in Athens will go a long way to determining just how much the Bulldogs are able to bounce back. They're bringing in enough that they should not slip any more, both in terms of SEC finish (2nd behind Texas A&M) or NCAAs. If they are able to hit on all, or even most, of their cylinders, the 'Dawgs could end up as high as 7th or so at NCAAs this season, with the potential to move back up the ranks rapidly in the next few years. There's no doubt that the loss of the seniors will hurt, particularly on the sprint free relays. However, DeSorbo does have a reputation for working some sprinting magic, so there's a good chance that the Cavaliers will find some new faces to fill in those relays. A lot will depend on the freshmen, some of whom's best times come from two or three years ago. This team looks built to contend for another ACC title, but there's some question as to whether or not it has the top end point scorers necessary for March. If the team wants to hold on to a top ten position at NCAAs, it'll also need some of the women who took a step back from ACCs to NCAAs to peak in March rather than February, something that should happen with experience. Hmmm, personally take exception to Swimming World not having regarded any of our Bears as Top 10 worthy material in their rankings below ~smh~...esp as 3 furdettes were deemed fit for inclusion there. Do however look very much forward to seeing Bug & co. tearing it up @ 2019 NCAAs and show up the inaccuracies of some of these contentious rankings! Smashing to see Sarah Darcel making it @ #29 here, but at the same time reckon Robin also deserves some mention & credit for her achievements in her debut NCAA season. With the 2018-19 school year underway, many teams are getting their toes wet with fall training as we dive into a new season. Last year, the Stanford women won their second straight national title and won all five relays, putting themselves amongst the talks of the greatest NCAA teams of all-time. With a new season commencing, many big names have left. NCAA champions Simone Manuel and Ally Howe have graduated. Katie Ledecky and Kathleen Baker also left college early to pursue pro careers. However with all those big names gone, there are still some big names left in college. 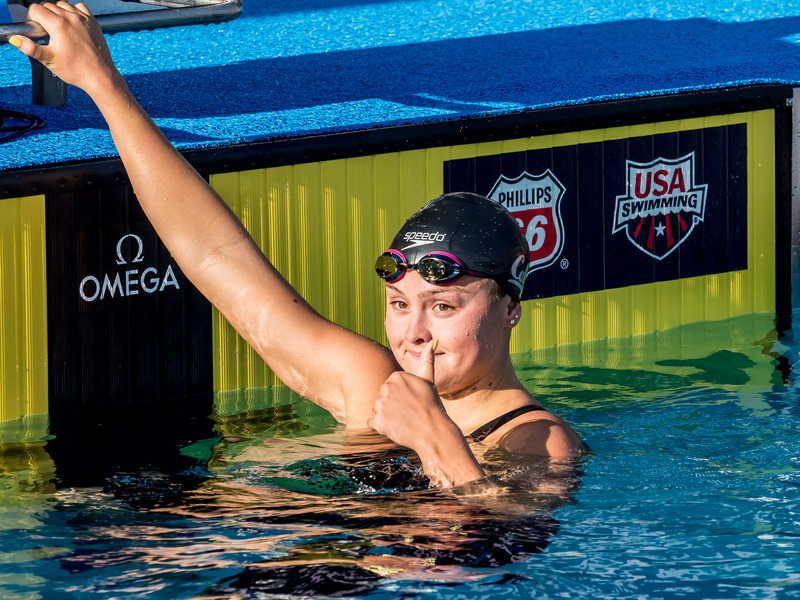 This senior class for 2019 might be one of the strongest we have ever seen in recent years, comparing to the class of 2017 which included Leah Smith, Olivia Smoliga, Lia Neal and Missy Franklin. With this year's strong senior class, it could be one of the fastest NCAA women's meets on record. Swimming World has compiled a list of the 25 best swimmers returning this season to get a sense of what the field looks like as we start duel meets in the next few weeks. This "pre-season poll" was based off of 2017-18 performances, with some newcomer's converted times factored into play. Going into the fall of 2015 if someone said that Katie McLaughlin would walk into her senior year with zero NCAA titles, no one would believe them. But injuries have gotten in her way and she is just starting to get back to where she was in 2015. McLaughlin reached three A-Finals in 2018, including the impressive 100 fly-200 free double that was perfected by another Cal great Dana Vollmer in 2009. 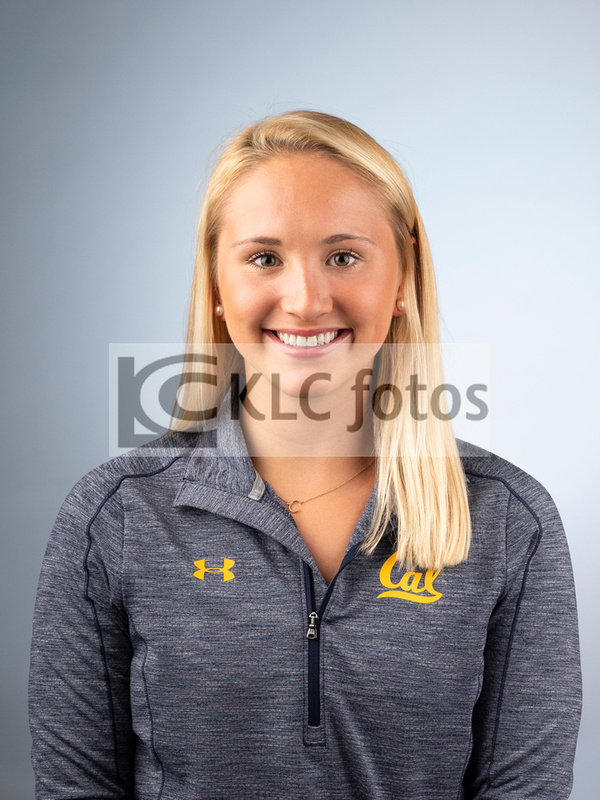 She made her first National team since 2015 by getting second in the 100 fly at Nationals this summer and is going to be a very strong asset for Cal's relays in 2019. Like her teammate McLaughlin, it's a little hard to believe Weitzeil has yet to win an individual NCAA title. To be fair though, Weitzeil had to compete with one of the best NCAA swimmers of all-time in Stanford's Simone Manuel, whom Weitzeil competed with at the 2016 Olympics. The sprint free events are wide open this year and Weitzeil is definitely a favorite in both the 50 and 100 because remember, Weitzeil still has the American Record in the 50 with a 21.12 from 2016 before she got to Cal. 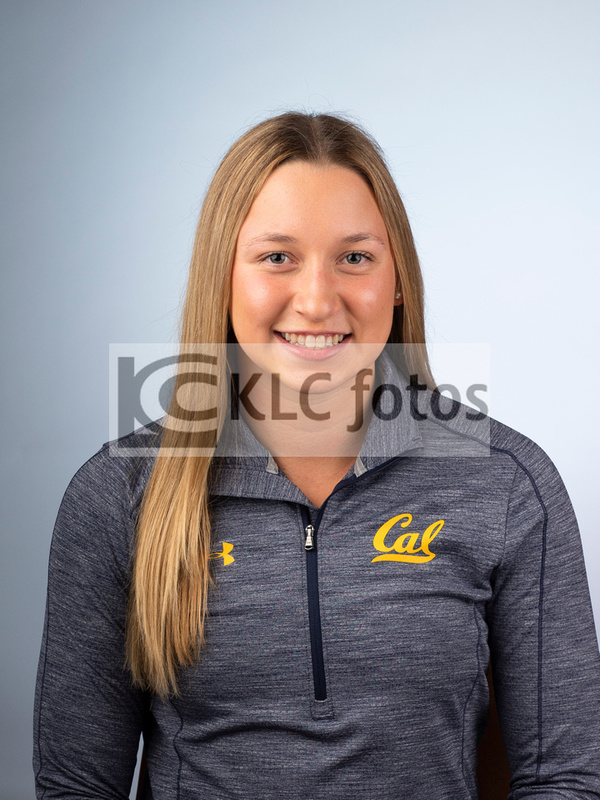 With no Kathleen Baker at Cal, senior Amy Bilquist is now one of the go-to swimmers in Berkeley. Bilquist has a wide range from the 50 free to the 200 back and can help out the Golden Bears on any of the five relays. 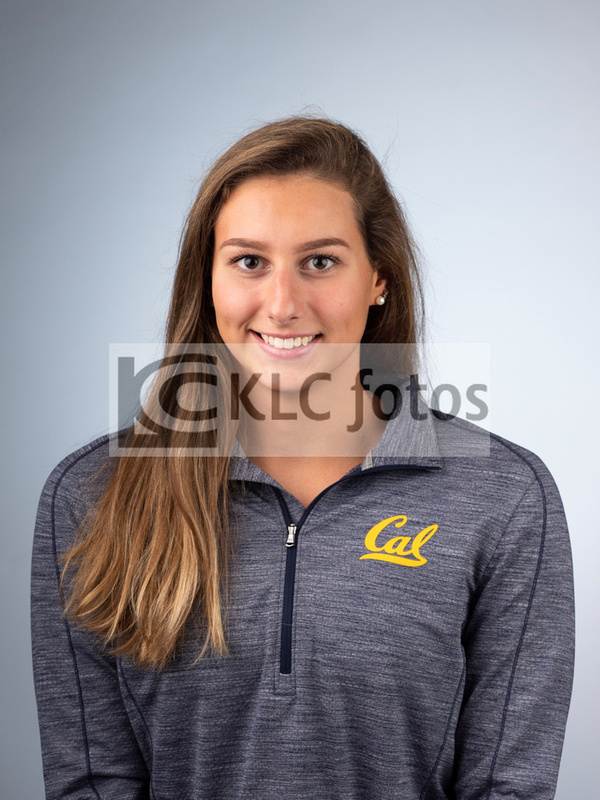 If Cal has any chance to chase down Stanford, they are going to be looking at someone like Bilquist to be able to swim as many events as she can. With Bilquist and Weitzeil back, Cal's sprint free relays look to be dangerous and could challenge some American Records. Well, in anticipation of SwimSwam's College Swimming Previews & Team rankings for the 2018-2019 season coming out in a day or two with an article on our likely #2 ranked Golden Bears, here are their 2018-2019 OUTLOOK for the competition. Thanks to the outstanding racing from Kathleen Baker and a very deep sprint free group, Cal secured a 2nd place finish at the NCAA Championships behind only Bay Area rival Stanford. The Golden Bears finished as high as 2nd in three different relays, while Baker won the 200 back crown in NCAA and American record fashion and Abbey Weitzeil found her way to the A final in the 50 and 100 frees. Freshmen Robin Neumann and Sarah Darcel delivered, both reaching an individual A final, while another rookie, Ali Harrison, helped Cal's breaststroke problem with a very solid 58.8 400 medley relay split. The top-end talent here is deep, and with Simone Manuel done at Stanford, Weitzeil will be in contention with Erika Brown for the 50 free title and Mallory Comerford for the 100 free title, pending any freshmen who could compete. Whether she wins or not is hardly too important, though - Weitzeil is one of the fastest sprinters in yards, ever, and she will keep relays in the title conversation while also bringing in a good 30+ points on her own. Meanwhile, Amy Bilquist and Maddie Murphy were both 21 flat starts last year and went 1-2 in the 50 free B final. Katie McLaughlin has made considerable strides in her sprint freestyle game, and freshman Elise Garcia comes in at 22.6/49.4. While more of a 200 freestyler, Neumann was a 48-low last season and will likely replace Baker's 400 free relay leg to join Bilquist, Weitzeil, and McLaughlin. As far as the 800 free relay goes, we might see those same four again, though a substitution might be made if Coach Teri McKeever wants to save a big gun for another relay. McLaughlin (4:39.4), Chenoa Devine (4:40.6) and Neumann (4:40.9) were all clumped together to lead the Bears in the 500 last year. McLaughlin could do either the 500 or the 50 on day 2 of NCAAs, but she may end up on all five relays and skip a day 2 individual since Noemie Thomas is graduated and off the fly medley leg. Whether or not that's the case, these three would all be cusp B final scorers. Devine was the only person to race the 1650 on the Cal roster last year with a 16:16.20 season best at Pac-12s, which is not in NCAA scoring range. Baker out is tough, but Sarah Darcel scored in the 400 IM A final last year and raced the 200 IM B final as a freshman. Half of the 2018 400 IM A final is either graduated or has gone pro, giving Darcel a great shot to repeat in the top 8. Keaton Blovad's 1:55.7 from Pac-12's would have B finaled at NCAAs, giving the Bears another option. Meanwhile, freshmen Bayer (4:12), Rajic (4:14), and Sumner (4:15) could all develop in the 400 IM, and British freshman Wilson brings in a 2:14 IM in long course which is not to be overlooked. McLaughlin went up top for both butterfly events, touching 4th in the 200 and 6th in the 100. She should also provide very strong relay splits for the Bears, though Maddie Murphy may be called on for the 200 medley relay. A pure sprinter, Murphy could free up McLaughlin to focus on the other four relays and add a third event, or she might allow for McLaughlin to anchor the 200 medley giving Weitzeil more room to do something else. Individually, Murphy is a fringe player for a 100 fly B final appearance. Cassidy Bayer is one of the best 200 flyers in yards in the incoming class, and could be a scorer in that event individually. Elise Garcia, too, is a very strong flyer with times of 52.7/1:56.6, so look for her to be another potential scorer for Cal. There's no replacing Baker, but having Bilquist in your back pocket (sorry for the pun) is a life saver. Bilquist is capable of sub-51 (her best is 50.50), and she wound up 10th in the 100 back at NCAAs. She traded out the 200 back for the 100 free individually last year, but she has been 1:49 before. Blovad was strong last year at 51.8/1:53.3, while Sophie Krivokapic-Zhou hit a 52.5 last year in the 100. Freshman Alex Sumner will certainly play into things in the 200 in particular, having been 1:52.3 (and 2:09.0 in LCM). Being in C+/B- territory is pretty darn good for the Golden Bears considering past seasons. Breaststroke may no longer be their Achilles heel, with 26-mid relay potential out of Weitzeil in the 50, and a sub-59 split from Harrison on the 400 medley was nothing to scoff at. Distance is the only roster group weaker than breaststroke, but Cal can get by with what they have, and Harrison is a fringe scoring option in the 100. Freshman Rajic may develop into something great for Cal, coming in at 1:00.6 and 2:14.1, and she's on the sprintier side of things which could be good for the 200 medley, too. Speaking of relays, I thought it'd be a good idea to take a first glance at what our relays will be like, especially after the graduation of Noemie and Thleen's early departure from the team, as they both contributed to four relays. Of course, Teri might decide to allow for Billy or Katie McL, or even Abbey to swim all five relays, rather than three events and four relays, depending on how the rest of our team develops. Good stuff! Thanks for the analysis. Haven't analysed all the potential permutations cos of so many moving parts, and a lot can change in the course of this new season with fresh players involved, but the suggested lineups seem pretty spot on, well done there! Keaton has been making steady improvements, and I have been quite impressed by her freestyle progression, but her 24.62 PB in the 50 Back does represent over a sec disadvantage to Thleen's insane 23.56...would basically be a massive margin to give away to our opponents in such a short relay. In contrast, Amy's 23.81 from 2017 Pac-12s would be a slam dunk for leading off almost every other Division I team in the country - and we would need every bit of speed against the furdettes' front end juggernaut lineup likely comprising of their freshman studs Taylor Ruck & Zoe Bartel (even if they move Ruck to anchor, Lucie can still fill in capably on leadoff). However, having lost Baker, we may need Bilquist to step in to help out in either or both of the individual backs, even though her free has looked more menacing as of late in short course (Billy's ongoing stress fracture issues possibly still negatively impacting her backstroke to a greater degree than her freestyle, esp on starts & walls). Another thought - I wouldn't completely discount the option of throwing our versatile Home Counties lass into the 200 FR lineup, perhaps @ morning heats, if she adjusts smoothly & quickly to the little pool. To be sure, Bears are impressively deep in the sprint free area, and AW is hardly a sprint specialist in spite of her being an all-rounder. Still, reckon consideration should also be given to Alicia for this relay if her development curve turns out to be promising in her froski season, and she can improve further on her personal best that presently stands at a converted time of 22.68 in this event (25.84 in the 50m Free from this year's British Summer Championships). Blovad has greatly improved her 50 LC Back. It could be that Bilquist's leg injury prevented her from improving while Blovad got faster. Keeks did leap from a 28.91 in her 50m Back @ 2017 Santa Clara PSS down to that 28.05 @ 2018 Nationals which is a rather massive drop at this distance! Amy's fastest 50 Back in LCM was a 28.25 back @ 2017 Nationals, but got slower in the 2018 edition with her 28.57, possibly stemming from her reported leg issue. For reference, Little Bean's 27.48 from semis @ 2017 Budapest (Worlds) earned her the 3rd seed into finals, and Baker went on to place 5th in finals with a 27.50. Fantasies aside lol, looking forward to this season and all that it may bring - always proud of the stellar accomplishments & valiant efforts of our swim reps in the blue & gold, both in and out of the pool! Go Bears! Friday, Sep. 21 | 11:00 AM | Anderson Aquatic Center | San Luis Obispo, Calif.
Cal kicks off its 2018-19 season Friday with what has become an annual visit to Cal Poly for the Queen of the Pool meet in San Luis Obispo. The competition features each swimmer taking part in 100-yard races in free, fly, back and breast events, plus a 100-yard individual medley, and the person with the lowest combined time will be crowned queen. A new winner will be declared this year, as Kathleen Baker, who claimed the last two titles, has turned professional. Last year, Sarah Darcel, now a sophomore for the Bears, was the runner-up with a combined time of 4:45.17, and she was followed by Abbey Weitzeil (4:47.34), Amy Bilquist(4:50.87) and Katie McLaughlin (4:51.62). Coming off a national runner-up finish, Cal has placed among the top three at the NCAA Championships 10 years in a row - the longest current streak in the country. Included in the run are four national titles, coming in 2009, 2011, 2012 and 2015. The Bears were also second in 2013, 2017 and 2018, and third in 2010, 2014 and 2016. Cal returns 23 members from its 2017-18 squad that finished as the NCAA runner-up. Included in the group are eight All-Americans - Amy Bilquist, Keaton Blovad, Sarah Darcel, Ali Harrison, Katie McLaughlin, Maddie Murphy, Robin Neumann and Abbey Weitzeil. The Golden Bears also welcome five freshmen to the roster - Cassidy Bayer, Elise Garcia, Ema Rajic, Alex Sumner and Alicia Wilson. Hmmm...Alex Sumner & Sophie = MIA? Andrew Seliskar, to little surprise, utilized his incredible versatility to sail to the crown, while Abbey Weitzeil, who is strong in more than just freestyle (she swam breast on Cal's 200 medley relay last year at NCAAs), earned queen status on the women's side. Neither of them are repeat champs from last year, as Matthew Josa won the men's title and Kathleen Baker the women's. 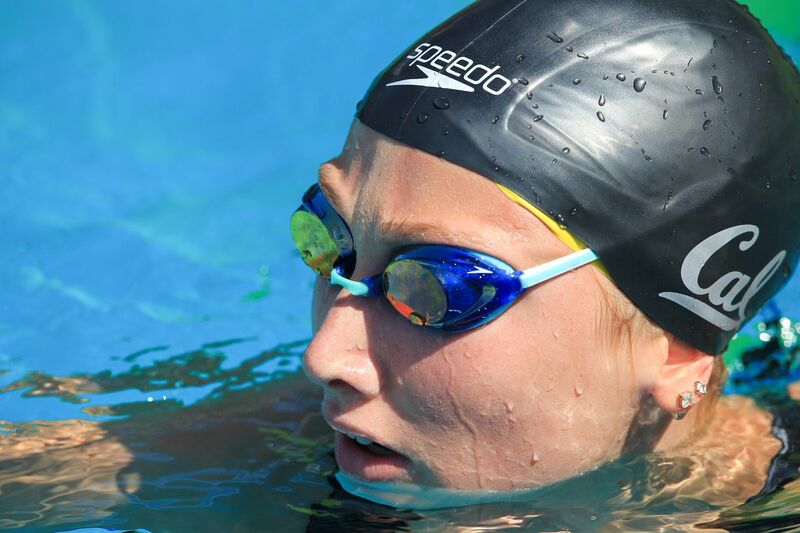 Seliskar was 48.30 in fly, 49.18 in back, 54.91 in breast, 44.06 in free, and rounded it out with a 49.25 in the IM. He won the free and IM races. 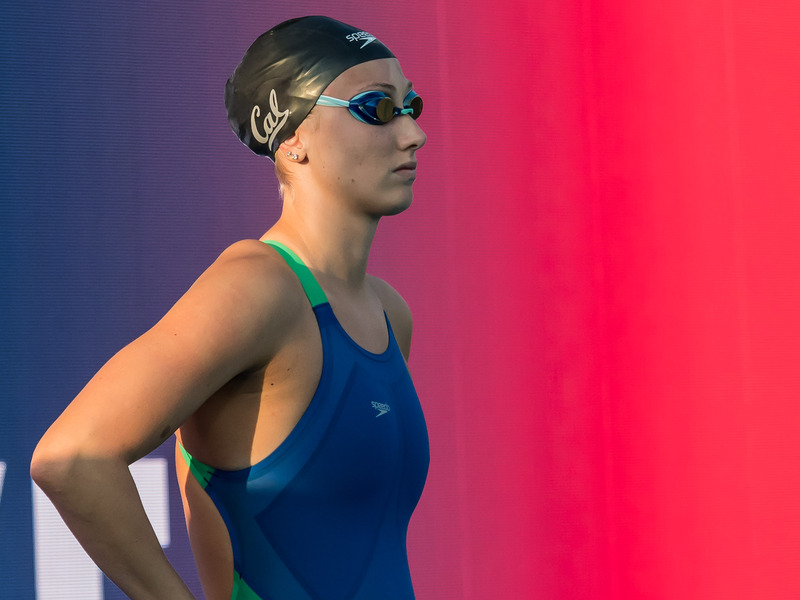 Weitzeil, meanwhile, was 58.15 in fly, 56.47 in back, 1:03.35 in breast, 49.38 in free, and 56.87 in IM, winning all but the butterfly, where she was 10th. For the women, Sarah Darcel was the first individual winner, taking the 100 fly (55.78) over freshman Elise Garcia (55.99) and senior Jenna Campbell (56.13). The sophomore Darcel, an All-American in the 400 IM, hit another top 4 finish in the 100 IM (58.51). That landed her 3rd behind Weitzeil (56.87) and Keaton Blovad (57.33). Blovad also had nice swims in the 100 back (56.70 - 2nd) and 100 free (52.18 - 4th). Sophomore Robin Neumann was 3rd in the 100 back (56.76), 2nd in the 100 free (51.21), and 4th in the 100 IM (59.71). Freshman Ema Rajic put up a 2nd place finish in the 100 breast (1:05.42) behind only Weitzeil. The mixed 200 medley relay saw Cal put teams in 1st through 4th place. The Bears' G team won the event in 1:38.12, keying on a 24.57 breaststroke split from Whitley. 200 free relay results are not yet published on Meet Mobile. Notably, freshman Cassidy Bayer was listed on Meet Mobile as 'Cassidy (in water) Bayer.' While she did swim the fly leg of a 200 medley relay and also the 200 free relay, this probably means she did not dive from the blocks and started from the wall instead for her individual events. She also did not race the 100 breast nor the 100 IM (everyone, assumed healthy, raced all strokes), meaning she may be continuing to deal with knee issues that have hampered her the last couple of seasons. Bayer was 4th in the 100 fly (56.57), and added times of 59.76 in the 100 back and 54.79 in the 100 free. Additionally, All-Americans and seniors Amy Bilquist and Katie McLaughlin, as well as freshman backstroker Alex Sumner did not race for Cal. All around PBs by Abbey, Keaton, Robin, Jenna, Alexa S-N, Dannie, and Elizabeth. Good showing from our frosh, especially Alicia, placing top 5, with Elise and Ema close behind. Ema also posted a solid 1:05.42 for 100 breast. Maddie, Sarah, and Ali struggling a bit? Both off their 2017 PBs by quite a bit. Abbey Weitzeil and Andrew Seliskar were the big winners at Friday's opening meet at Cal Poly. SAN LUIS OBISPO - Cal kicked off its 2018-19 season by crowning a new champion at the Queen of the Pool meet Friday at Cal Poly, with junior Abbey Weitzeil taking top honors for her efforts in five different events. The unique event, which included men's and women's teams from Cal and Cal Poly, features swimmers competing in the 100-yard freestyle, 100-yard backstroke, 100-yard breaststroke, 100-yard butterfly and 100-yard individual medley. The times are added up, and the person with the lowest combined time is declared queen for the day. "Congratulations to Abbey for winning the meet today," head coach Teri McKeever said. "This meet always serves as a good way to kick off the season. We saw some promising things, as well as some areas where we need some work nothing unusual. We also have a few people banged up and held them out of the meet as a precaution, especially because it's so early in the year." Weitzeil easily topped the women's field with an overall time of 4:44.22, more than five seconds ahead of runner-up Keaton Blovad, who came through at 4:49.43. Sarah Darcel picked up third-place honors at 4:53.88, and she was followed by Robin Neumann(4:56.65) and Alicia Wilson (4:57.08). Weitzeil dominated the individual races, taking first place in four of them 100 back (56.47), 100 breast (1:03.35), 100 free (49.38) and 100 IM (56.87). Darcel claimed the 100 fly in 55.78. In the men's competition, the Bears' Andrew Seliskar was crowned king of the meet. 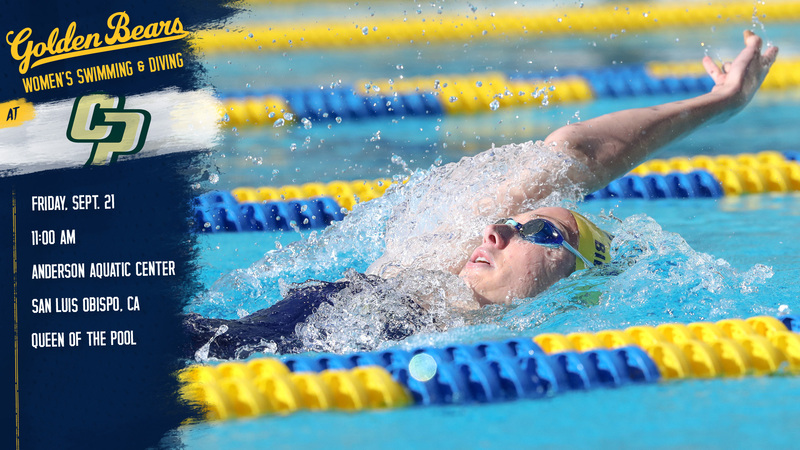 The Cal women are back in action Oct. 5-6 at the Chick-fil-A Invitational at Fresno State, and host their first home meet of the year on Oct. 10 when Utah visits Spieker Aquatics Complex. V. impressed by our Queen of the Pool this year, as Abbey really laid down some impressive times in the 100 Free & 100 Breast for the beginning of the season! Keeks also did good. Some concerns naturally over the no-shows (Dream Teamers in particular - also wondering if Alex S had sustained an injury from all that mosh-pitting last weekend :p), and partial shows (agree that Cass appears to be still recovering from her knee issues as hinted at earlier by that knee brace, but an encouraging sign is her at least rising to the challenge of competing in those events where the risks of aggravating that injury were slighter). Absolute numbers & times don't really tell us all that much esp with the season just starting, but bearz012's posting of all those stats from the past few years may provide some interesting talking points. Here's a quickie comparison of combined times & placement for those of our Bears who had competed in both seasons. The 2018-2019 NCAA season will be about replacing departed stars, especially so on the women's side. With a number of huge names graduating or turning pro early (Katie Ledecky, Simone Manuel, Kathleen Baker), even the best rosters in the nation will have serious openings for a new name to step up. For Cal, which loses do-everything star Baker, the heir-apparent is already making herself, well, apparent. 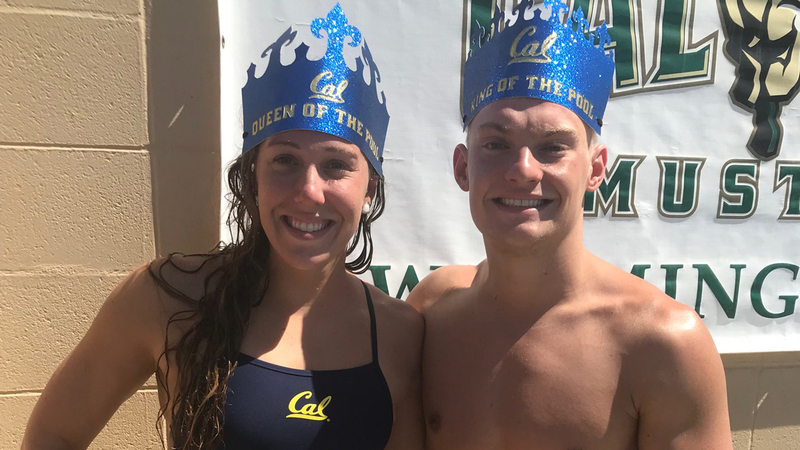 Abbey Weitzeil is probably best known as an Olympic sprinter, but the Cal junior won four of five events across three strokes and the IM discipline to earn the 'Queen of the Pool' title at Cal Poly's yearly "King & Queen of the Pool" dual meet with Cal. The meet features 100s of fly, back, breast, free and IM, with the most versatile swimmer earning the meet title based on strong performances through all five events. What was expected was Weitzeil's 100 free win. Coming near the end of the meet, the event was a blowout in favor of Weitzeil, whose 49.38 was nearly two seconds faster than the field. The swim came after a 56.47 win in the 100 back and a 1:03.35 win in the 100 breast, with the freestyler Weitzeil (who swam breaststroke on Cal's 200 medley relay last year) beating the team's top breaststroke options. Weitzeil was also 58.15 in the 100 fly, though that earned her just 10th, and she led off a mixed 450 medley relay in 24.24 (presumably swimming backstroke) plus led off the winning mixed 450 free relay in 22.26. With those six swims behind her, Weitzeil finished the day with a 56.87 win in the 100 IM, winning by half a second. If Cal is to challenge Stanford (and hold off a bevy of teams in the fight for a top-2 finish), they'll need to replace Baker's historic production. A great season from Weitzeil could do just that and more, especially if her versatility can continue to cover Cal's breaststroke weakness on relays. This week's Performance of the Week goes to Abbey Weitzeil for her performance at Cal's annual King & Queen of the Pool against Cal Poly last week. Weitzeil, who is coming off a resurgent long course summer where she qualified for the Pan Pacific Championships and World Championships, was crowned the Queen of the Pool after registering the fastest aggregate time of her swims during the competition. 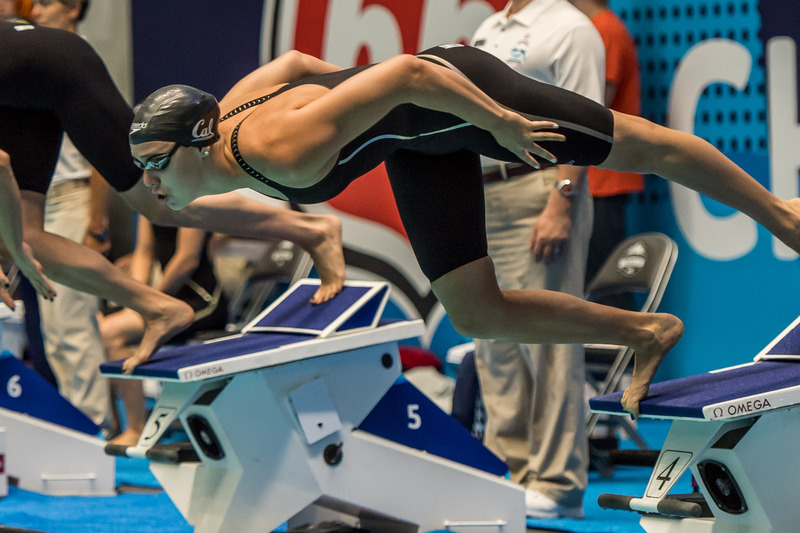 The format of the meet has swimmer's compete in 4 x 100's of each stroke before ending with a single 100 IM. 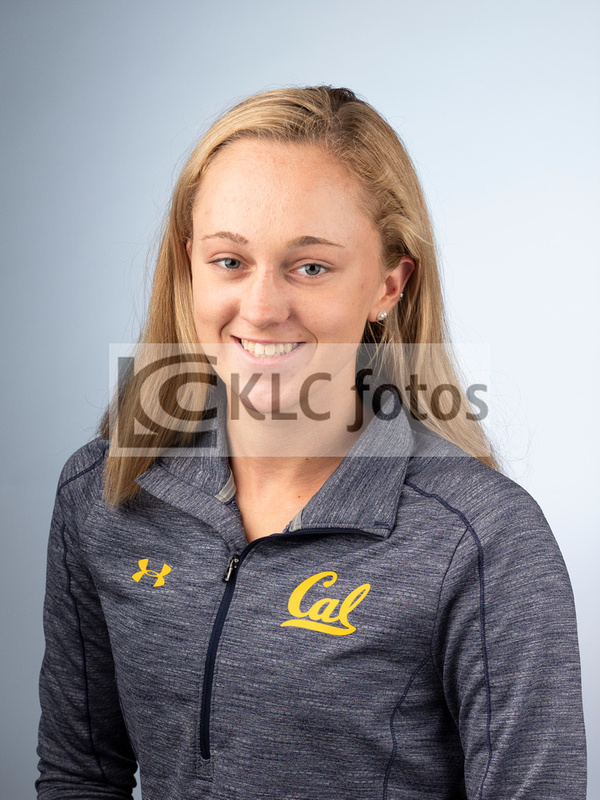 The Cal junior opened with a 58.15 100 fly that was only good for 10th, but from there worked her way to the top with a 56.47 100 back, a 1:03.35 100 breast, a 49.38 100 free, and a 56.87 win to finish off the day in the 100 IM. 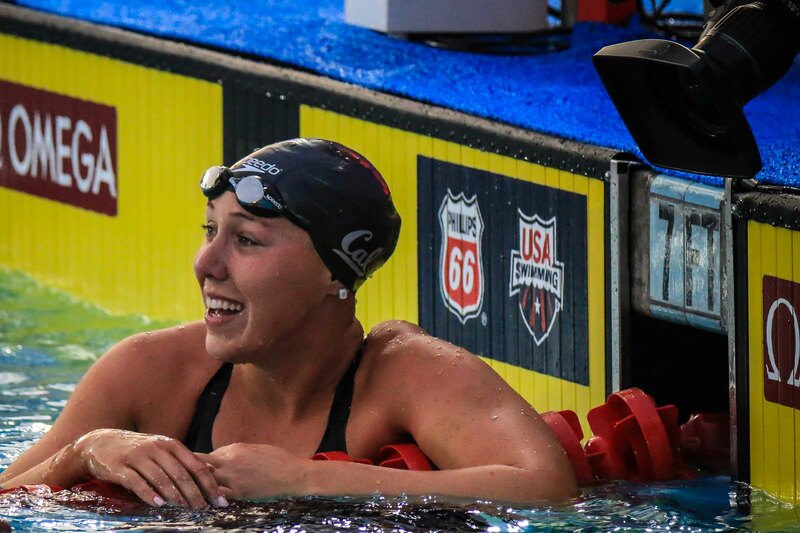 Kathleen Baker, who recently turned pro ahead of what would have been her senior season at Cal, was the reigning champion of the meet. Weitzeil will now be among the leaders now for the Cal Bears as they enter this season coming off a second place finish at NCAA's behind Pac-12 rival Stanford. 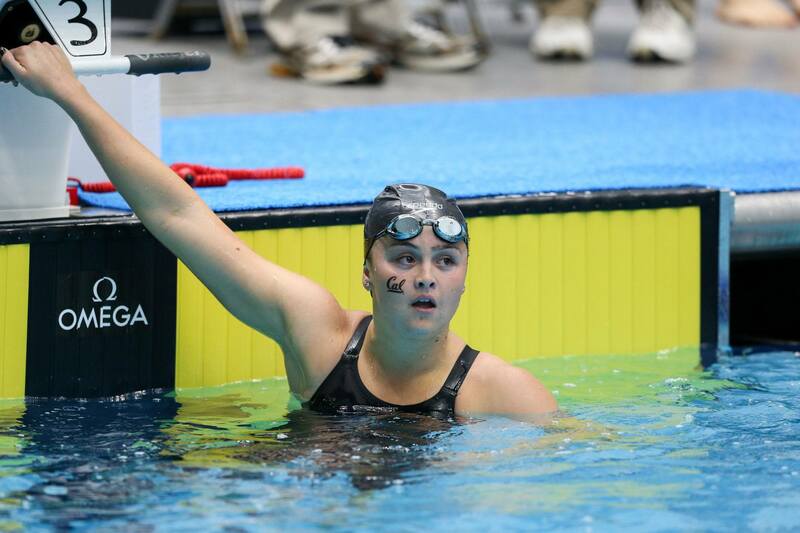 Congratulations Abbey Weitzeil on earning Swimming World's Performance of the Week! You can see the full results from the meet here. Led by upperclassmen Katie McLaughlin and Abbey Weitzeil, Teri McKeever's California Golden Bears will take on a very typical schedule in 2018-2019. Outside of the normal in-conference opponents, Cal's schedule is highlighted by a dual meet with Carol Capitani's Texas Longhorns in Berkeley on Saturday, November 10th. Not too long after that, the Bears will travel east for the Georgia Fall Invitational in Athens the last weekend of November. Hmmm, another potential addition to the DL for Bears?! Guess we will have a clearer picture of everyone's health & status at the Chick-fil-A Invite down in Fresno this Fri & Sat.